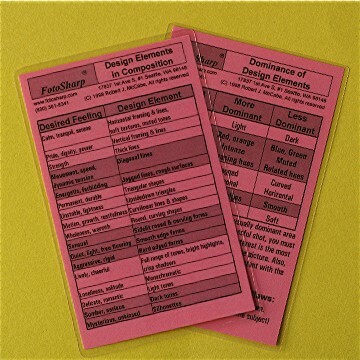 This 3.5" x 5.5" laminated cheat sheet summarizes the elements of design and their influence in creating powerful images. A handy reminder of how lines, shapes, forms, textures, colors, tones, etc. can be used to give your pictures the desired feeling or emotion.